This black and grey armband for iPhone 4 and iPhone 4S for arm girth between 30cm and 40cm is made of soft and durable materials. The holder case can keep your cell phone secure and protected when you are doing sports. And the breathable mesh will make your arms comfortable even in hot days. - Suit to hold iPhone 4 and iPhone 4S. Customer Rating: 0 customers would recommend this product to their friends. Agree with them, or you have different ideas? Write your comments. This black and grey armband for iPhone 4 and iPhone 4S for arm girth between 30cm and 40cm is made of soft and durable materials. 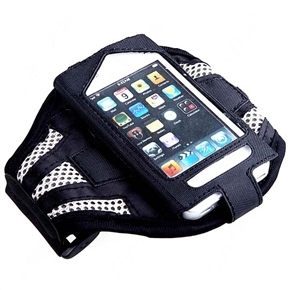 The holder case can keep your cell phone secure and protected when you are doing sports.